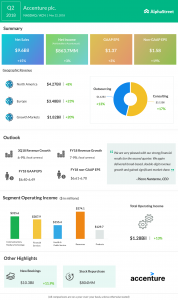 True to its slogan, Accenture (ACN) delivered a solid performance for its second quarter of 2018 beating market expectations. Total revenues jumped 15% with the Consulting and Outsourcing segments growing 17% and 13% respectively from a year ago. The company also saw revenue improve across all its operating groups and geographic regions. Diluted earnings rose to $1.37 per share, but saw a negative impact from the U.S. tax reform. 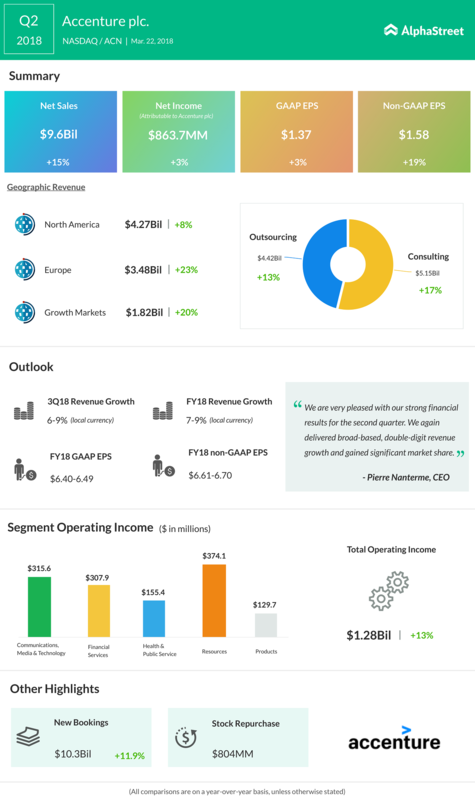 Accenture raised its revenue growth and adjusted EPS guidance for the fiscal year 2018. The full-year outlook assumes a higher positive impact from foreign exchange on its results. However, the company cut its profit margins, which sent the stock plummeting as much as 6% casting a net of disappointment over its otherwise solid results. The operating margin outlook was trimmed due to reduced profits from the healthcare and public service areas as well as high expenses. The company’s ongoing investments in digital marketing, cloud, and security services have proven beneficial, and these three areas comprised more than 55% of Accenture’s revenue in the quarter. As part of its efforts to keep up with competitors like IBM (IBM), Accenture has made around 70 acquisitions in the digital and cloud arena over the past three years spending more than $3 billion. The company has been gaining prominence in the digital design space, with Walt Disney (DIS) picking Accenture Interactive to be its innovation partner. Accenture continues to expand as it gets ready to set up its fourth employment center in Cherrywood, South Dublin. All in all, despite a few minor hitches, Accenture seems to be on the right path of growth and expansion.